While online purchases only make up a relatively small overall percentage of total beauty and personal care purchases, the channel is experiencing significant growth each year and is rising in importance to both consumers and retailers alike. 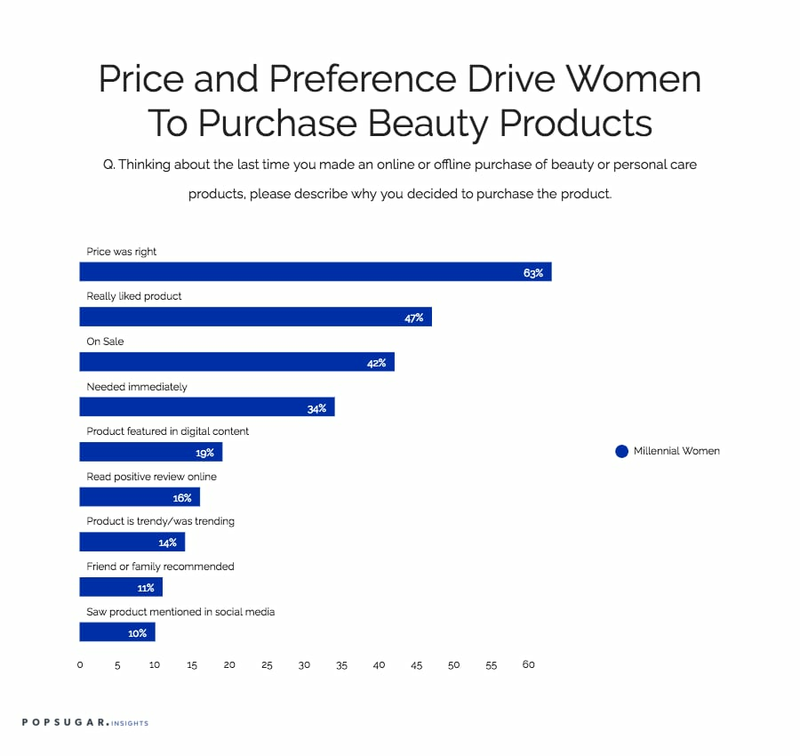 As part of the POPSUGAR Insights study "Beauty Evolved: How Millennial Women Shop for Beauty and Personal Care," we wanted to explore how women shop online for beauty products and specifically dive deeper into their shopping mentality when heading online to buy beauty products. Millennial women typically know what they want when they head to their laptop or smartphone to purchase beauty products. Over 40% of millennial women have a specific product in mind when beginning their purchasing journey, and only 7% say that they made an impulse purchase the last time they bought beauty or personal care products online. Millennial women are 21% more likely than women between the ages of 35-49 to say they had a specific product in mind, while women 35-49 are 62% more likely to say that they routinely purchase that specific product. Now that we know what they're thinking when they begin to shop for beauty and personal care, we next wanted to identify why they decided to make the purchase. Here again, price and convenience are important key drivers to purchase, with 62% of millennial women saying that the price was right and 42% saying that they wanted to take advantage of a current sale. Over one in three millennial women said that needing it immediately was what caused them to pull the trigger on the purchase. Beyond price and convenience, digital content has emerged as a particularly strong driver of product purchase for beauty products. Collectively, content was cited by 45% of millennial women as a key driver, with 19% saying they saw the product featured in digital content, 16% saying they read a positive review of the product online, and 10% saying they saw the product mentioned in a social media post or video. Millennial women are 44% more likely to be driven to purchase by digital content than women ages 35-49. Additionally, never underestimate the benefits of a trend, as 14% of millennial women said they were inspired to purchase the product because they saw it was trending.